Moscow, June 13, Interfax - Chairman of the Imperial Palestinian Orthodox Society Sergey Stepashin told about an interesting interpretation of the famous Lenin's depiction with the log. "There is a legend (it is not proved) that Lenin together with Sverdlov were carrying a piece of the cross destroyed in Kremlin," he said on Tuesday at his meeting with students of Sts Cyril and Methodius Church Doctorate in Moscow. The cross was set up in 1905 in Kremlin to commemorate Moscow governor Great Prince Sergey Alexandrovich who was killed there by terrorist Kalyaev. "The cross was the first thing Bolsheviks demolished in 1918," Stepashin said noting that experts can neither prove nor disprove that the photographer took a picture of Lenin with that very cross. The cross in Kremlin at the site where the great prince was killed has recently been restored and consecrated by Patriarch Kirill of Moscow and All Russia. 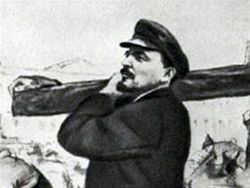 Lenin's photo with the log became classics of photo art and inspired many painters to dedicate their works to this topic.